On the 16th of december, at 13.15 in N300, Naturvetarhuset, Erik Billing will present his Licenciate Thesis with the title Cognition Reversed - Robot Learning from Demonstration. Discussant is professor Tom Ziemke, Högskolan Skövde.The presentation will be held in swedish. Read pressrelease in swedish. Umeå University spends more than 60 millions on technology scientific research. Eight young researchers will be recruited to strengthen the quality of technical training. – We will mainly focus on research areas with links to our civil engineering program. An improved quality of programs is ultimately to increase our students' employability. – It will notably be done by our young scientists to work closely with industry, not least at the regional level, says Åsa Rasmuson-Lestander, dean of the Umeå University Faculty of Science. Users of mobile services is the focus of a new research project at the Center for Distance-Spanning Technology (CDT) at Luleå University of Technology. Tillväxtverket has recently committed close to 17 million crowns from the EU regional fund, where researchers from Umeå and Luleå is included. - The project aims to give mobile users the tools to develop and combine mobile services of their needs, says Anders Broberg, interaction designer for the Department of Computer Science at Umeå University. Read more about the project in UCIT. Professor Martin Berggren in computer science has received a total of 2.5 millions swedish crowns in research grants from Vetenskapsrådet, spread over three years. – Money will be used for basic research and innovation in design optimization. These methods are expected to be used for such diverse applications as the design of artificial blood vessels and speaker horns. – The allocation will be used to support a researcher and a new graduate, says Martin Berggren. Students need a current link between their education and their future employment. Fredrik Georgsson, program manager for the engineering program in technical computer science, have for half a year been working at Tieto to learn more about what awaits students in the telecombusiness. Read more about his experiences here. Supercomputers are used today to make complex calculations within both research and industry. Unfortunately there are problems where computing power is insufficient, and the systems are difficult to handle.But with automation of the interaction between super-and personal computers will become much easier in future to link resources in the grid system, says P-O Östberg. He is presenting his licentiate thesis Architecture, Design Methodologies, and Service Composition Techniques for Grid Job and Resource Management. The presentation takes place 23 october at 13.15 in MA 121, MIT-huset, Faculty opponent is docent Vladimir Vlassov, KTH. Read more about P-O Östberg in swedish. The research project "Smart forest application" facilitate the work of forest machine drivers, for example through automatic loading of logs. Friday, October 9 were results from the project presented for a large number of invited guests. 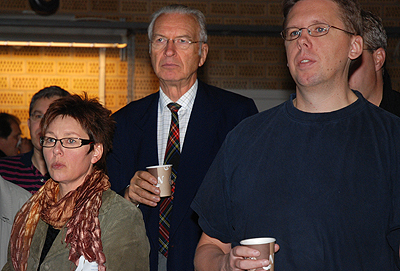 Here from the left Maria Hedblom, Vindeln, Carl Kempe, Kempestiftelserna and Ola Ringdahl, Computer Science. Read more about the project here in swedish. This Saturday it's time for the Nordic Championship in Programming, a contest that is simultaneously held in Sweden, Norway, Denmark, Finland and Iceland. The purpose of the contest is to figure out the solution to a handful of problems with varying difficulty and then write programs that solves them as fast as possible. IT Company CodeMill AB was founded last year by three civil engineers who have studied technical computer science at the faculty of technics. Now they are nominated for the prestigious year's spin-off company distributed by Umeå University, Uminova Innovation, Uminova Invest and Connect North in connection with Umeå Gala on November 12th. Read more about the nominated here in swedish. 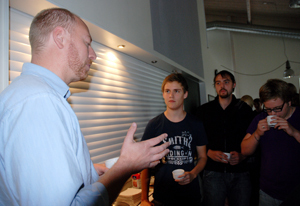 Mats Wikström from Nomura mingles with students. This year students learned on wednesday to sharpen their personal elevatorspeach in 30 seconds. They also met the local IT industry ; Tieto, Sogeti, Nomura and Codemill and learned what kind of working skills they're looking for. See more photos from the businessday on Flickr. Emanuel Dohi, former student of computer science at the University of Umeå is now self-employed in Codemill with a focus on the digital entertainment industry. During his journey as entrepreneur, he has seen the importance of contacts and networks to succeed in business. Going away on international conferences in order to expand the network is important, says Emanuel Dohi. He has recently visited a major game conference in Germany. our next release, version 4! Algodoo, that makes it easy to test and understand the laws of physics, are now being launched on the Web through Algoryx. The program, which will revolutionize school physical lessons, is developed by civil engineering student Emil Ernefeldt. 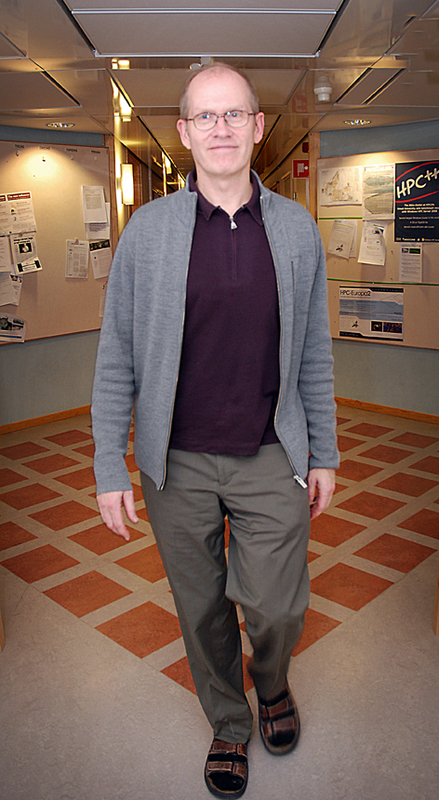 It was his thesis in technical computer science from Umeå University in conjunction with the supervisor Kenneth Bodin at the Department of Computer Science. Algodoo has also entered into a partnership with Intel in which has a project for school computers known as the Classmate PC, and Algodoo will be one of the programs that retailers can choose with the computers. Ny Teknik- "Intresset för ämnet höjs"
For ten weeks 26 students has participated in the course Design of Emergent Systems and have had free hands to develop a joint project on sustainable development. One result from the course is a number of different ideas for a virtual platform enabling people to change their environmental awareness. - The result was an idea bank, forum, games and contests in which families and companies can challenge each other to ride a bike instead of taking the car, says student Caroline André. - We can now hand over our results to the next course as a prototype, says Rickard Tornblad. A logotype in form of a green and blue drop on a green background has also been designed to symbolize the sustainable company Re the students have worked with. Data mining is a fast-developing field of study, using computations to either predict or describe large amounts of data. The increase in data produced each year goes hand in hand with this, requiring algorithms that are more and more efficient in order to find interesting information within a given time. In this thesis, methods are studied for extracting information from semi-structured data, for finding structure within large sets of discrete data, and to efficiently rank web pages in a topic-sensitive way. On Friday, June 5, Ola Ågren will defend his PhD Thesis “Finding, Extracting and Exploiting Structure in Text and Hypertext". Faculty Opponent is professor Maarten de Rijke, Informatics Institute, University of Amsterdam, Netherlands. Developer of world-class work in Umeå in the company Nomura after having studied at the Department of Computing Science, says umea.se. - We have a very good relationship with the University, which is also very important to us. For two and a half years ago we hired 15 people from Computing Science, it was the best 15 and since then there has been a couple more, says Jonas Kröger, local manager for the Japanese Nomura in Umeå. Cooperation with companies is important for the department, not least in the effort to offer students good master thesis. Several times during the semester students are invited to meet a number of companies from Umeå to get information on what they are working with. Two of the companies that participated Wednesday, May 27, were Nomura and Sogeti, represented by Håkan Lindqvist and Mats Wikström from Nomura and Anders Wink, Sogeti. 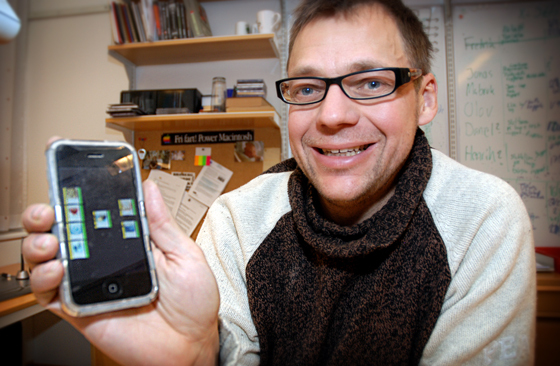 Håkan Lindqvist, to the left, is one of several students who studied Computing Science at Umeå University. He is now working for Nomura. During these last weeks we have been working to develop a system to get people to act and think about how to live and achieve a more sustainable development. The presentation will be held in the MIT-"Ljusgården", on Monday June 1:st at: 13.00-15.00. For a more sustainable future on our earth, teachers, postgraduates and students are welcome to take part of this presentation. "Share your opinions and have influence our future”. With these words the students at the course Design av samverkande system are inviting to a workshop on sustainable development. Meet the students that are designing systems which allow people to let their ideas be heard. - It's always fun when our teacher gets attention in this way, and perhaps extra fun when the award comes from the students themselves, says Erik Elmroth, Prefect. Earlier this year, Jonny Pettersson received an additional educational price: Ångpanneföreningens forskningsstiftelses Pris för Framstående insats inom Teknisk utbildning". On the 27th of April, at 13.15 in N320, Naturvetarhuset, Lars Karlsson will present his Licenciate Thesis with the title Blocked and Scalable Matrix Computations -- Packed Cholesky, In-Place Transposition, and Two-Sided Transformations. Discussant is prof Michael Thuné, Inst. för Informationsteknologi, Teknisk Databehandling, Uppsala University. On friday the 3rd of april Johan Tordsson will defend his PhD Thesis “Portable Tools for Interoperable Grids - Modular Architectures and Software for Job and Workflow Management" Faculty Opponent is professor Ramin Yahyapour, Director of the IT and Media Center, Dortmund University of Technology, Germany. Heuristics for designing object oriented examples for novices. Discussant is Kathryn E. Sanders, Dept. of Mathematics and Computer Science, Rhode Island College, Providence, RI, USA. A very warm welcome to the opening of the Interactive Institute Umeå, Wednesday 18th of February! The event starts at 16.00 in Ljusgården in MIT building, Umeå University campus. After the inauguration there will be drinks, food and mingle. Akademiska Hus proudly presents a special day of thrilling winter experiences at Campus Umeå on Thursday 19 February. Students, staff and the general public can try a variety of things unique to northern Sweden such as sitting on reindeer hides around an open fire in an authentic Sami ?kåta? tent and tasting exotic wilderness food. You can also ride Icelandic horses, meet some reindeer up close, have a go at cross-country skiing, grill sausages, take a dip in a hot tub (don't forget your swimsuit) or enjoy an exhilarating dog sled ride. Algodoo is a new software for Clas Mate PC to make the school's physics lessons simple, accessible and above all really fun. Tech World have visited Umeå company Algoryx for a closer look. Many of you may know Algodoos predecessor, Phun, that in early 2008 received a lot of media attention. Phun simulate physics in a simple and attractive manner and is originally a thesis of Emil Ernerfeldt that studied technical computer science at Umeå University. - I wanted to create an application that brings the creativity of people, where anyone can implement their ideas quickly and easily, "says Emil Ernerfeldt, now full-time employee at Algoryx. On friday the 6th of March Stefan Johansson will defend his PhD Thesis Tools for Control System Design - Stratification of Matrix Pairs and Periodic Riccati Differential Equation Solvers. Faculty opponent is Paul Van Dooren, Department of Mathematical Engineering, Catholic University of Louvain, Louvain-la-Neuve, Belgium. Do not forget to reply on your notification of admission at studera.nu. Last date for courses spring 2009 is December 30. Helena Lindgren gets 2,76 MSEK, over a period of three years, to develop techniques and methods for interactive and "intelligent" care of the elderly. As much as 88 percent of those who took their IT-master of engineering degree at Umeå University had permanent employment after one year. It is the best figure of all IT-master of engineering programs throughout Sweden. Umeå beat traditional institutions such as Chalmers, Lund and KTH. The first part of the NGSSC course "High Performance Computing II: Algorithms and Applications" are giving this week (November 24-28) in Umeå. The course is a collaboration between Uppsala (UPPMAX) and CS & HPC2N at Umeå. The lectures in Umeå are given by Robert Granat, Sverker Holmgren (Uppsala University), Lars Karlsson, Bo Kågström, and Mikael Rännar. You are welcome to visit any of the lectures! Microsoft carries out a capital investment on newly started companies in Umeå with focus on innovations in the IT-area. The cooperation between Microsoft, Umeå University and Umeå municipality is unique for the country. Carl Kempe, Chairman of the Kempe Foundations, Vice Chancellor Göran Sandberg and Sverker Holmgren, Director of Swedish National Infrastructure for Computing (SNIC) inaugurated on the 20th of October HPC2N super cluster Akka. On tuesday the 7th of October, vice-chancellor Göran Sandberg will visit the department. He will be informed about the Department of Computing Science, and mr Sandberg will inform about what is happening at Umeå University. Bonnie Nardi discussed the evolution of information spaces based on her ethnographic research in North America and China on a popular video game, World of Warcraft. She described certain aspects of a trend to go "back to the future" in the evolution of such spaces. On the 4th of October, this years edition of Nordic Collegiate Programming Contest will be held. Every team consists of up to 3 persons, 1 computer and you have 5 hours to solve 8-10 problems of various nature. Are you interested in problem solving and programming? Sign up on the NCPC page. Registration is open until October 3rd. Under the title Movie and Information Technology, InternetBay is arranging an event at 27th of November where networking is in focus. Among the speakers are Lars-Johan Jarnheimer, fd CEO on Tele 2 and Johan Mardell, executive producer of the movie "ARN". The students on the course Design for Emergence has come up with three ideas, prototypes, around the theme Umeå C; culture, pleasure and avail, that focus on involvement and interaction between people and the city. Essential in this course is the development of the ideas, and the reflection about the development work process. The course comprice 7,5 ECTS credits on advanced level, and introduces the concept of /Emergent Interaction System. An /EIS is defined to consist of an environment in which a number of actors share some experience/phenomenon, and in which part of the interaction among actors in the system emerges via a shared feedback loop. This summer Mattias Lidman, a student on computing science, is choosing the computer prior to the beach since he is working in a project within Google summer of code. Mattias is going to build a compression driver to the XIO input/output library for the Globus Toolkit. The driver will compress/uncompress data as it passes through it, with the purpose of achieving seemingly faster than network speed transfers. The new driver will then be inserted into existing GridFTP servers for experimentation. The project has already started, and will continue to the end of august. High Performance Computing Center North (HPC2N) at Umeå University has installed a new cluster consisting of 5376 CPU-cores. The system is one of the world's 100 most powerful supercomputers on the coming TOP500 listing. But that is not all. - We are running both Linux and Microsoft operating system software on the cluster, and with Microsoft HPC Server 2008, we have obtained impressive results for the Linpack benchmark which will be presented at the ISC'08 conference in Dresden in June, says Bo Kågström, director of HPC2N.